For your exclusive use if you rent both bedrooms. Shared if you take just one. Clean, nice bedroom with a private bath. Two persons pay the same as one. Per night: $30.00 for a room or $60.00 for the whole apartment. Per night: $35.00 for a room or $70.00 for the whole apartment. Please note: We charge an extra fee for mini-stays unter 7 days. There is enough space in the two rooms for four adults or a couple with two teenage children. Just in case this is your first trip to Cuba: bed linen and towels are provided. Breakfast and other meals are not included in the price but can be ordered if desired. 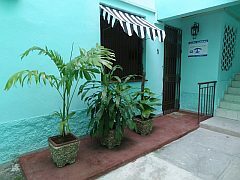 You will stay on the calle Oficio, a highly demanded address in the Old Town Habana Vieja in Havana. Close to everywhere a visitor to Havana might like to go. A brief walk to Plaza Vieja or to those new Cafes in the Old Town which are popping up almost every week in Havana. You save on taxis. If you prefer to cook and rent both rooms the kitchen will be all yours. Of course, you would share the kitchen if you rent one room only. Comfortable Living Room allows you to receive visitors in a pleasant interior. Each room has its own bathroom . 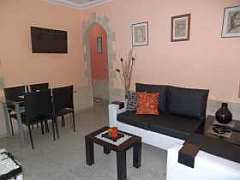 Due to attractive interior this apartment enjoys increasing acceptance by business travelers to Cuba. Wi-Fi, however ist not provided yet (2016). Your reservation will by accepted on HolaCuba ™, a leading portal for Casas Particulares, where travellers have been booking accommodation in Cuba from as early as 2001. Taxi ride from Havana Jose Marti Aiport [HAV] costs about $25 but your hosts can pick you up for the same amount personally. Pick-up would also be available from the Varadero [VRA] airport ($90) or from Havana Bus Terminal ($15). Just let us know while making the reservation. Click here to see the picture of your hosts and their car.